Numark Fragranced Baby Wipes - 72 Soft Wipes. 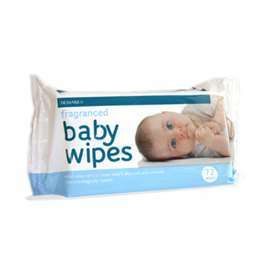 Lightly fragranced baby friendly wipes for use when changing nappies and keeping fresh and clean throughout the day. Gel formulation that keeps wipes moist for longer. Contain Aloe Vera to keep baby's skin soft and smooth. Peel back the label label, use wipe as required. Dispose of wipe with household waste. Ensure the pack is re-sealed after use to prevent the wipes drying out. Do not flush down the toilet. Avoid storing in extremes of temperature and humidity. Aqua, Paraffinium Liquidum, Glycerin, Polysorbate 20, Phenoxyethanol, Acrylates/C10-30 Alkyl Acrylate Crosspolymer, Parfum, Prunus Amygdalus Dulcis Oil (Almond Oil), Aloe Barbadensis (Aloe Vera), Methylparaben, 2-Bromo-2-Nitropropane-1, 3-Diol, Tetrasodium EDTA, Sodium Hydroxide, Butylparaben, Ethylparaben, Propylparaben.